Here’s a few shots along Nova Scotia’s Cobequid Pass Toll Highway........a 45km section of TCH 104 between Exits 7 and 11. The top of the pass is only at a 250 metres elevation (below) but in the winter it can be treacherous......the Pass is then closed and electronic message boards direct traffic onto the old TCH104 (now NS4) route through the Wentworth Valley. Service Areas are located on each side of the pass at Glenholme and Thomson. Below, I’m standing on what was the old two-lane TCH 104......now the westbound on-ramp at Thomson. 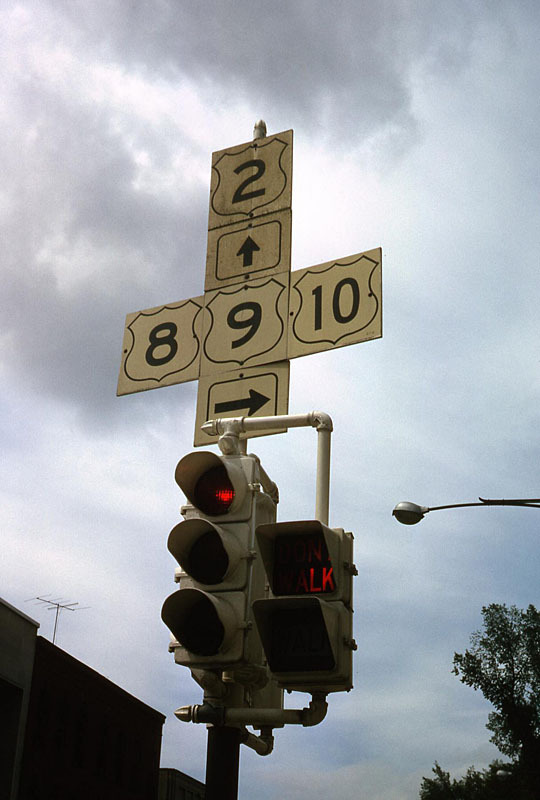 The original alignment was the now eastbound lanes on the left in the distance. The Cobiquid Pass sweeps in from the left. I'm curious about the US 4 shield. Please let me know the story on that! 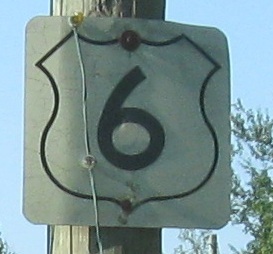 Nova Scotia uses the same shield shape as the US route marker. 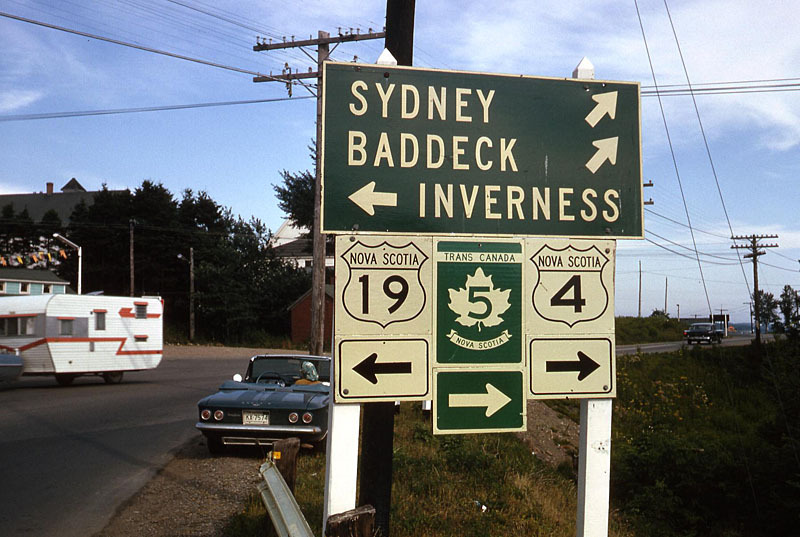 Along with Ontario's Highway 407, it would be nice if Nova Scotia would join the E-ZPass IAG. It will probably happen eventually…….. especially with the amount of trucking on the Pass. Currently you need separate accounts but Cobequid Pass transponders also work on the Halifax and Confederation Bridges. In a perfect world, E-ZPass would morph into NAFTAPass, and be accepted on every toll road and every toll crossing in Canada, the U.S. and Mexico. Thank you Agent Steel for the info and the pix. I learned something new today thanks to you! I remember really enjoying the Cobequid Pass Toll Highway. In Nova Scotia I do a pretty good job of obeying speed limits, for the most part, but not on that road. I recall it being posted at 110 and I think the only time I dipped below 130 on the entire tolled section was around the toll plaza (for obvious reasons), with a good part of the trip being spent at over 140. (Only one I know of on the island.) Anywhere else? So that leaves Newfoundland as the only Maritime I don't know about. Otherwise, they all used the US shield at some point. That's not a US shield. Much as several western provinces favor the "home plate" shape. The NS Provincial Government announced today that tolls on the Cobequid Pass will be removed in 2019 when the construction bonds are paid. So that leaves Newfoundland as the only Maritime I don't know about. Not to derail the topic, but referring to NL as part of the Maritimes is a good way to rile up a Newfoundlander's blood. So by all means, go ahead. 1. So do they charge EZ-Pass holders the same as non-transponder people or raise the toll rates for everyone to keep that influx down? Remember, the toll rates on 407 are to keep the number of vehicles on the road on the razor's edge between maximizing usage and avoiding congestion. 2. Are there issues with the EZ Pass agencies selling data to private companies? For example, I've been told that the Province of Alberta does not cooperate with 407ETR as they do not sell personal data like that. There may be some issues with that personal data being shared with the private consortium. Additionally, according to their website as of 2014 there are over 1.2 Million 407ETR transponders in circulation. What incentive is there for 407ETR to give that up? they are the same ones as the EZ-pass ones. Are there issues with the EZ Pass agencies selling data to private companies? For example, I've been told that the Province of Alberta does not cooperate with 407ETR as they do not sell personal data like that. There may be some issues with that personal data being shared with the private consortium. Quite the opposite - the E-ZPass group has strict rules that customer data not be shared with or sold to anyone unless subpoenaed by a court. There were initially issues with North Carolina joining E-Zpass because, under pre-existing state law, the logs of who paid what toll and when would have been considered public record and available to anyone. This directly violated E-Zpass' privacy rules and they had to sort that out before they were able to get their system interoperable. As for toll-by-mail functionality, not sure how it goes in Canada but in the US there are plenty of privately compiled databases of people's names, addresses, and license plate numbers which toll agencies will often tap into in order to bill drivers from out of state rather than try to grapple with that state's DMV for the info. The DMV in New York, for example, refuses to share anything with any other state (they share with Ontario and Quebec via mutual agreement), but I've been billed by mail with NY plates elsewhere in the US in spite of this. Think about it - every time you check into a hotel, they already have your name and address and they ask for your license plate number. The dealership that sold you the car knows all these things as well. As, potentially, does any shop where you got the vehicle serviced. At least some of these types of businesses will happily sell this info, and it's totally legal for them to do so as long as the information they're selling is information you gave them willingly. I would defer to the owners of the Highway 407 ETR concession to decide that. They have not been bashful when it comes to increasing tolls since they took-over the concession (75 years?). As far as maximizing use, I do not think that there would be all that much added traffic from honoring E-ZPass, but it would make life easier (and possibly more profitable for the owners of the concession) to honor E-ZPass. As Duke87 suggested, it is not allowed by the E-ZPass Group. Beyond that, at least some U.S. states have laws that severely limit what E-ZPass data may (and may not) be used for. The incentive is that the transponder technology is getting old, and they might be better-off with something new(er), such as the Mark IV technology or one of the 6-X sticker tags. Of course, that probably means that 407 ETR will need to sell those transponders, and not lease them as they do now. 407 ETR forces you to rent there transponders at a cost that is higher then other systems so to stop people from just getting an free EZ-pass then can charage an higher EZ-pass trip fee higher then the transponder fee but lower then the video charge. or be like IN and change an % fee up top of the full toll. If I recall, the original concept with 407 ETR transponders (and this coming before the privatization) was that they were to use something similar to the EZ Pass system in payment. A 407 ETR transponder has 3 lights, a red light, yellow light, and green light, of course when we use it, only the green light is ever used. Originally, the green light meant that your account was in good standing, a yellow light meant that your balance was low, and a red light meant that you have went into the negatives and a bill will be sent to your house.....indeed originally supposedly you could remain anonymous. Instead, they used a system where you always got a green light, and a bill was sent to your house, the other system I described is more in line in how the EZ Pass system works. What has been mentioned before is indeed true, the 407 ETR transponders have a monthly leasing fee of $3.90, unlike an EZ Pass, which if you get them at the right place, you can get one with no monthly fee at all, it's essentially like the PRESTO card used for transit here in the GTA. The 407 will cut corners and will try to cheat you no matter what, ask cl94 about this, when we were doubled billed because he used my transponder to use the 407, I was charged for the trip, so was cl94, it was his car, his plate, and he got a bill as well, there is a reason why no one likes 407 ETR. I don't think that this is true. To my knowledge the 407 billing practice has always been what it is today. Back in the '90s before the 407 opened to traffic, the province just happened to select a transponder that had more than one light, despite the fact that they never billed like ez-pass. This is the document I was referencing, I do recall when the transponders first coming around about usage of the yellow and red lights as described here, obviously they never chose to do it that way. I wasn't aware of an annonymous transponder option for the 407. Certainly, traditional accounts weren't billed that way.